Crushing strength is the strength necessary to resist the compressive and squeezing forces that distort the cross section of a wire rope, as it runs over sheaves, rollers, and hoist drums when under a heavy load. Regular lay rope distorts less in these situations than lang lay. Fatigue resistance is the ability to withstand the constant bending and flexing of wire rope that runs continuously on sheaves and hoist drums. Fatigue resistance is important when the wire rope must be run at high speeds. Such constant and rapid bending of the rope can break individual wires in the strands. Lang lay ropes are best for service requiring high fatigue resistance. Ropes with smaller wires around the outside of their strands also have greater fatigue resistance, since these strands are more flexible. Abrasion resistance is the ability to withstand the gradual wearing away of the outer metal, as the rope runs across sheaves and hoist drums. The rate of abrasion depends mainly on the load carried by the rope and the running speed. Generally, abrasion resistance in a rope depends on the type of metal that the rope is made of and the size of the individual outer wires. Wire rope made of the harder steels, such as improved plow steel, has considerable resistance to abrasion. Ropes that have larger wires forming the outside of their strands are more resistant to wear than ropes having smaller wires that wear away more quickly. Corrosion resistance is the ability to withstand the dissolution of the wire metal that results from chemical attack by moisture in the atmosphere or elsewhere in the working environment. Ropes that are put to static work, such as guy wires, maybe protected from corrosive elements by paint or other special dressings. Wire rope may also be galvanized for corrosion protection. Most wire ropes used in crane operations must rely on their lubricating dressing to double as a corrosion preventive. Wire rope is designated by its diameter, in inches. The correct method of measuring the wire rope is to measure from the top of one strand to the top of the strand directly opposite it. The wrong way is to measure across two strands side by side. To ensure an accurate measurement of the diameter of a wire rope, always measure the rope at three places, at least 5 feet apart (fig. 5-7). Use the average of the three measurements as the diameter of the rope. NOTE: A crescent wrench can be used as an expedient means to measure wire rope. The term safe working load (SWL) of wire rope is used to define the load which can be applied that allows the rope to provide efficient service and also prolong the life of the rope. The formula for computing the SWL of a wire rope is the diameter of the rope squared, multiplied by 8. Example: The wire rope is 1/2 inch in diameter. Compute the SWL for the rope. The first step is to convert the 1/2 into decimal numbers by dividing the bottom number of the fraction into the top number of the fraction: (1 divided by 2 = .5.) Next, compute the SWL formula: (.5 x .5 x 8 = 2 tons.) The SWL of the 1/2-inch wire rope is 2 tons. Figure 5-7. 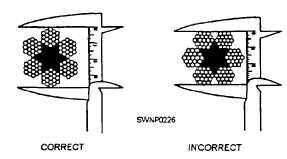 - Correct and incorrect methods of measuring wire rope.